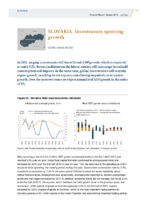 In 2015, surging investments will boost Slovak GDP growth, which is expected to reach 3.2%. Better conditions on the labour market will encourage household consumption and imports. At the same time, global uncertainties will restrain export growth, resulting in net exports contributing negatively to economic growth. Over the next two years we expect annual real GDP growth in the order of 3%.